I have been on a muffin-making kick recently! It all started with my renewed love affair with whole grains, plus a general attempt to include more healthy treats in my diet so I don’t feel deprived. The emphasis on ensuring adequate protein intake comes from the fatigue I encountered earlier this year. This recipe for Vanilla Crunch Muffins comes courtesy of one of my favorite retailers, Vitacost.com (I’m not an affiliate of this company, but I do participate in their Refer-a-Friend program where new customers get $10 off, plus I get $10 off my order, too). <—-Click this link to get the coupon. The kind folks at the company asked if I wanted to develop some recipes to help promote their site. My only compensation was that they sent me the ingredients for two recipes, but I negotiated a special giveaway for you guys…$100 gift card for one lucky winner!!! Before I link to the giveaway, I want to share this special recipe with you for High-Protein Vanilla Crunch Muffins using quinoa flakes. Believe it or not, but this was my first time using this product and I was blown away by how versatile and delicious the flakes are. 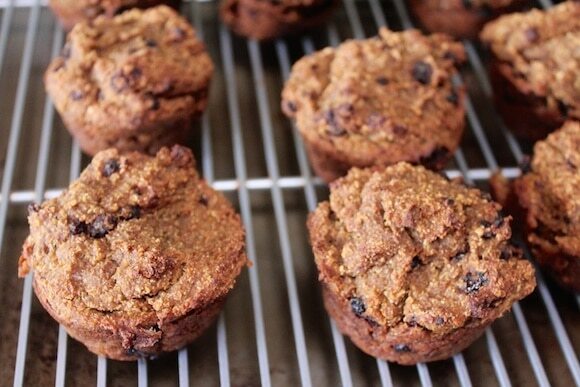 The dry ingredients for these muffins include quinoa flakes, baking powder, currants, cinnamon, vanilla protein powder (optional), and walnuts. The wet ingredients include a chia/flax “egg,” ripe bananas, pumpkin puree, unsweetened almond milk, and vanilla extract. Can you tell I am proud of myself? When it comes to baking, I’ve had my fair share of hits and misses, but these beauties are definitely a hit! Preheat oven to 350°F. Spray a muffin tin with nonstick cooking spray and set aside. Combine quinoa flakes, baking powder, dried currants, ground cinnamon, protein powder, and chopped walnuts in a large bowl. Use a spatula to stir ingredients together. In a small bowl, combine the sprouted flax and chia seeds plus the water. Use a spoon to stir gently. Set aside for at least 5 minutes to thicken. In the meantime, place the bananas, pumpkin puree, almond milk, and vanilla extract in a food processor. Pulse several times to break up the bananas, and then turn on high for about 30 seconds or until ingredients are smooth. The mixture should be pourable; add additional almond milk if necessary to achieve the right consistency. Pour the mixture from the food processor into the bowl with the dry ingredients. Add the chia/flax mixture and use a spatula to stir together. 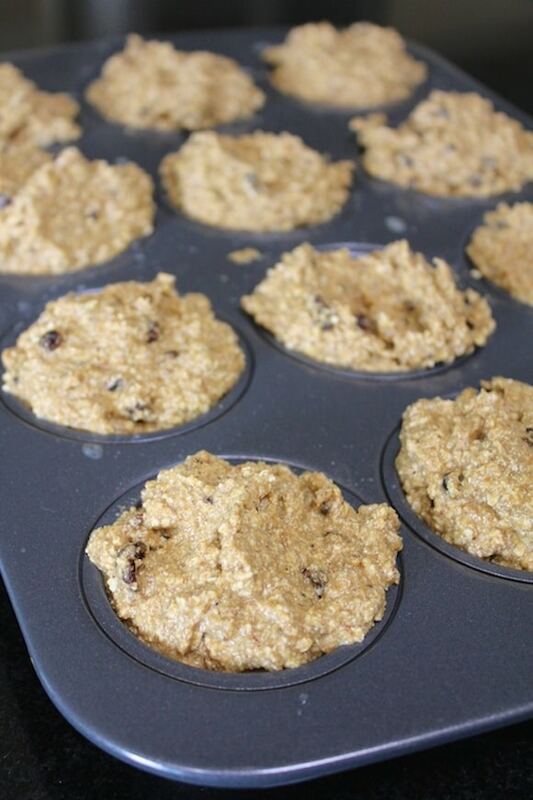 Use a big spoon to divide the batter between the muffin wells, filling each one all the way to the top. Bake muffins for 40 minutes or until the tops have turned a deep golden brown. Let muffins cool slightly before removing from the muffin tin. Serve warm. * The protein powder that I used has stevia in it. If you do not use this brand or you leave the protein powder out completely, I recommend adding ½ cup of raisins to ensure that the muffins are sweet enough. Again, I’m super excited to be able to offer one reader a $100 gift card to use at Vitacost.com. Due to legal restrictions, only residents of the United States, excluding Rhode Island, 18 years of age or older, may enter. I’ll select the winner at random on Thursday, April 3rd. Good luck! P.S. 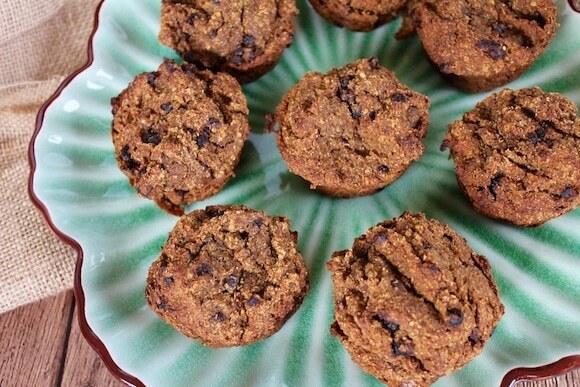 Looking for more healthy baked goods recipes? Check out my Cinnamon Muffins, Banana-Sweetened Chocolate Chip Oatmeal Cookies, Gluten-Free Pumpkin Spice Muffins, or Almond Pulp Cookie Crisps. 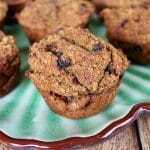 This recipe has been submitted to Healthy Vegan Fridays. I’ve just re-discovered Eden unsweetened soy milk…adds a nice creamy finish to my porridge as well as a healthy boost of plant protein 🙂 Thanks for this giveaway, Carrie! I recently discovered mana bread! I LOVE it! I’m loving flaxmilk. I have always hated the taste of soy or almond, so this is a great solution. I recently discovered chia based omega capsules. I really like unsweetened almond milk and I”ve been using sunwarriors plain protein powder for a couple of years now. Fabulous! 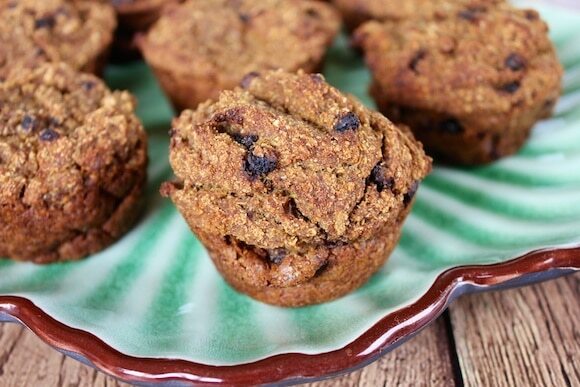 I am the queen of quinoa flakes so these would be wonderful to try! I recently discovered the wonderfulness that is coconut butter and coconut oil! Maca is a recent discovery for me. I love it! I just found these freeze-dried soups at Sprouts that are 100% vegan! So easy on the go. This isn’t a discovery, but a renewed taste for simple, steamed vegetables. I got so caught up in all of the fancy salads and sauces that I forgot how much I love a big bowl of steamed broccoli! There ‘ya go, Robin! Isn’t it funny how such simple foods are so delicious? I discovered almond milk it’s really good. I just made my first batch of millet yesterday…yum!!! I am also totally head over heels in love with teff. I recently discovered Oat Milk.. making my own! I used 1 cup of regular (gluten free) oats soaked over night and rinsed, whirled in my Nutrabullet with 1 cup of water, then added 2 more cups of water, then strained through a fine mesh sieve. You could add more or less water, depending on how rich you want the milk. I usually make vegan yogurt with a combination of homemade almond and cashew milks, but I’m making yogurt today with a combination of almond and OAT milk in an effort to try to reduce the fat content.. I hope it comes out good! I just re-discovered coconut water, fresh from the coconut. I’d forgotten how much I love it! This looks delicious and easy! I used to make muffins on a weekly basis but got a bit jaded – think I should return to my baking roots! I’ve never seen quinoa flakes here – the fact that we get quinoa is a miracle, and even then it’s uber expensive. I don’t suppose there’s a clear-cut alternative to them? I hate replacing such unique ingredients because I know they are chosen for a clear reason. Either way, yum! Well, I’ve been using coconut oil for food for a while, but I just recently started using it as a moisturizer… amazing! What a great recipe! I am going to follow the directions exactly. Absolutely! I am going to the ‘big city’ tomorrow and look for a couple of the ingredients. I love Vitacost! I’m new to coconut aminos. The muffin recipe looks delicious, I even have quinoa flakes. Those muffins look really good! I like that they are higher in protein too. I recently discovered coconut milk. I rediscovered flax seeds recently. I forgot about them for a while but I’ve been including them into no bake cookies! I just picked up a couple of boxes of quinoa flakes yesterday. I’ve used them before and really liked them as a binder and filler (instead of oats), but I haven’t had any in the house in ages. 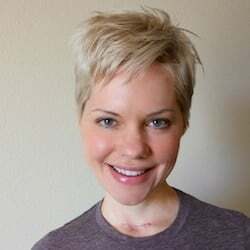 I did notice that Vitacost (huge fan!) had a really good deal on them, but I found some at the store for a decent price (and instant gratification *wink*). I just discovered sumo mandarins–they are amazing! My friend gave me a container of Umpqua Oats. It has whole rolled oat groats, flax, chia, and freeze dried apples and blueberries. Just add hot water. Great for travel. I recently discovered Ancient Harvest Quinoa Flakes. I absolutely love the peanut butter cookie recipe on the back of the box. I’ve been on a sunbutter kick lately- so yummy! I recently tried my hand at chia seeds…gotta keep working on that one. Carrie, these look FABuloso! I love VitaCost, too! Aren’t they just the best? I spend way too much there though. haha! I only recently discovered Maca powder. It’s great! And they have it at a great price on VitaCost (of course). I’m going to PM you about NET. I’m about to sign up and I believe you are already certified, right? Someone recently introduced me to Butler Soy Curls. Great for those who use those fake meats. I use Vitacost every month! I have been eating more whole grain rice . My boys have fallen in love with milk make from coconut flour. After straining, I use the pulp in cookies, so it’s a no-waste proposition. Thanks; the snickerdoodles I made were not airy, but they hit that melt-in-your-mouth velvetiness we thought we would never again enjoy. And the boys loved dunking them in the coconut milk, too. As ever, I was thrilled to have my boys devouring Nutritarian-style treats and begging for more. Such a gift, to be able to create well-loved foods which truly FEED my sons! Nothing tastes as good as feeling great…but that doesn’t mean the food is sub-standard! Mmmmmm, snickerdoodles. 🙂 Your boys are so lucky to have a mom so dedicated to their health and happiness. And, of course, I totally agree that healthy food can taste every bit as delicious as the stuff that doesn’t keep us feeling our best. I really love coconut oil spray! I just started having smoothies with lots of veggies in it. Chickpea flour crepes, with savory or sweet fillings. 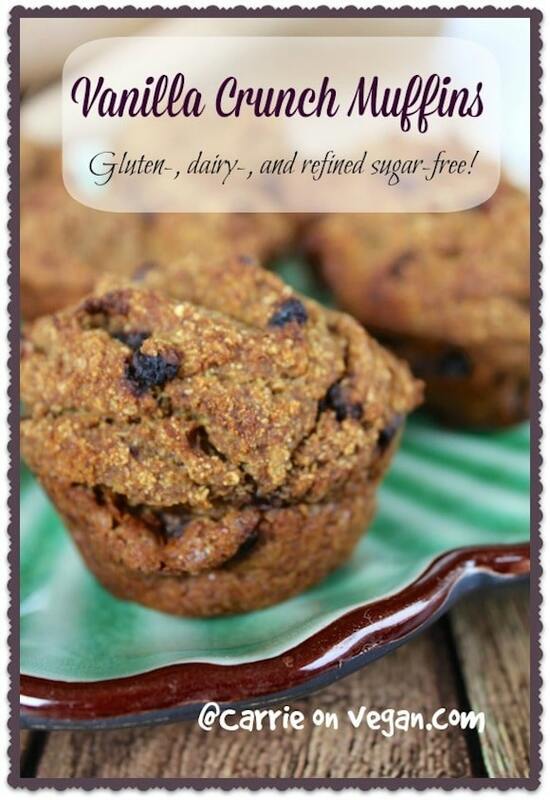 I think quinoa flakes will be in my first purchase so I can try these muffins out! Carrie, I just wanted to say thanks again for such a great prize! I made my order the same day I got the gift code, and managed to spend $99.37! I was able to stock my pantry with raw cacao nibs, nooch, hemp seeds, coconut butter & more! Thank you!!!! What can I use instead of pumpkin puree? 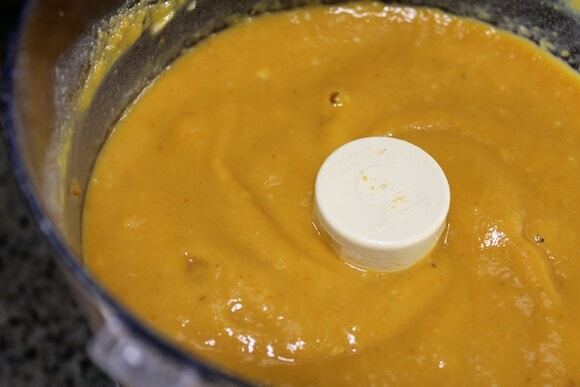 Butternut squash puree or applesauce.